The Gallipolis Christmas Parade has be moved to Dec. 8. GALLIPOLIS — For the first time in several years, the Gallipolis Christmas Parade will not be held the first weekend of December. Parade organizers said they are moving the traditional trot to Dec. 8 and slated to start rolling 1 p.m. According to Gallia Convention and Visitors Bureau Executive Director Amanda Crouse, lineup will be scheduled the same time as was previously arranged, just on Dec. 8 instead of this Saturday. Several meteorologists reportedly predict a high chance for rain, said Crouse, hence the decision for the event’s rescheduling. Currently, around 90 organizations have signed to walk with the parade, compromised of businesses, nonprofit and government groups. 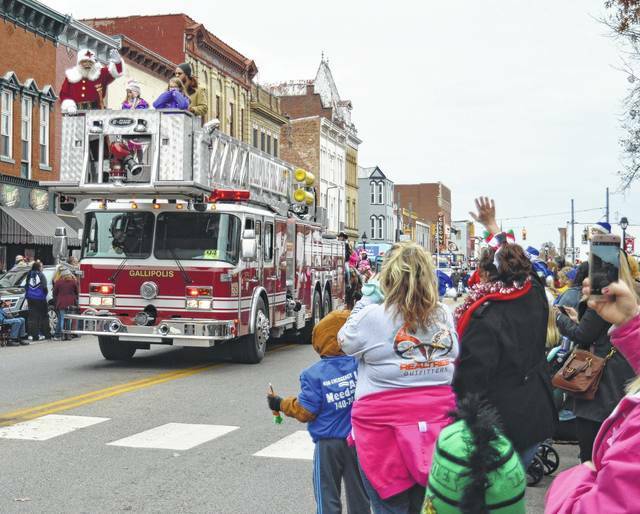 The gift-giving legend will be riding a firetruck, said Crouse, as is tradition in Gallipolis. Crouse said the visitors bureau had taken responsibility for the parade from the Gallia Chamber of Commerce shortly after the passing of former Chamber Executive Director Lorie Neal. The bureau has had responsibility for roughly the last six years. Santa Claus is anticipated to be available for visitation in the City Park Santa House after the parade. The Gordon family has the honor of serving as this year’s parade marshal in memory of passed Gallipolis resident, city manager and area philanthropist, Robert Gordon, more commonly known as Bob or Bobby Gordon. Gordon died on Sept. 24 and has long been remembered as a director of the children’s residential treatment program at Woodland Centers, a Gallipolis city manager, an executive director of the Gallia-Jackson-Meigs Treatment Alternatives to Street Crime organization as well as a Gallipolis Health commissioner among his many other services to the Gallia community.